After 11 days of voting, the public has selected 20 finalists from 1,536 entries in four categories. This Final 20 will continue on with the possibility of winning a $20,000 category award and, ultimately, the $200,000 Public Vote Grand Prize. GRAND RAPIDS, Mich. October 5, 2014 – ArtPrize, the radically open international art competition today revealed the public’s top picks, 20 works from among 1,536 entries that are now one step closer to winning the world’s largest art prize. 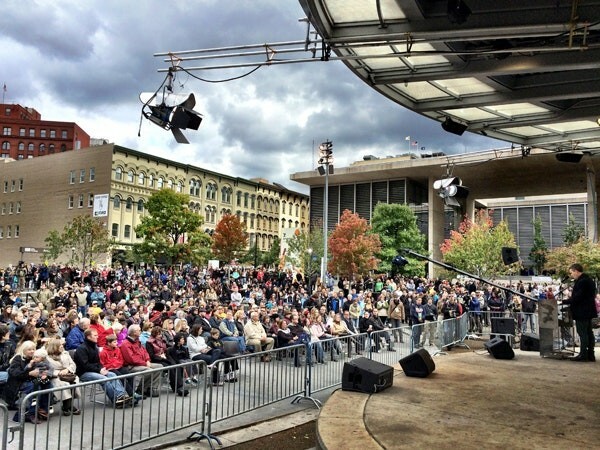 Thousands of visitors filled Rosa Parks Circle in downtown Grand Rapids this afternoon to hear ArtPrize founder Rick DeVos and executive director Christian Gaines announce the Public Vote Final 20. Over the course of 11 days, 37,283 individuals cast 352,732 votes, selecting five entries from within each of four entry categories to move onto the second round. These 20 works have captured the public’s eye and will move to the second round of voting, where they will vie for the chance to take home $260,000 in prizes. ArtPrize visitors have one more opportunity to voice their opinion and decide the winners of $260,000 in prizes. Round 2 Voting kicks off at 3:00 p.m. EDT today, October 5, and will continue through October 9 at 11:59 p.m. EDT. Each registered voter may cast up to 20 votes, one for each of the Final 20 entries, during this second round. The winners of both the public vote and the juried awards will be announced at the ArtPrize Awards on October 10. The conversation will continue next week at the two-part series “Why These Finalists?”. On both October 6 and 7, a panel of three art experts will discuss half of the public and juried finalists in a lively, humorous, and irreverent debate—further exploring the tension between public and expert approaches to assessing art. Free and open to the public, “Why These Finalists?” will take place in the ArtPrize HUB Soundstage in front of a live studio audience, and will be broadcast live on WOOD TV8.